Williams Baptist University has selected three science students for a pilot research program in marine conservation. The program is made possible by a grant WBU received this year from the Bosch Community Fund to promote STEM (science, technology, engineering and math) fields. WBU students chosen to take part in the program are Caleb Hickman of Pine Bluff, Ark. ; Paige Johnson of Saffell, Ark. ; and Kyrsten McLemore of Paragould, Ark. Hickman and Johnson are both juniors at Williams, and McLemore is a sophomore. 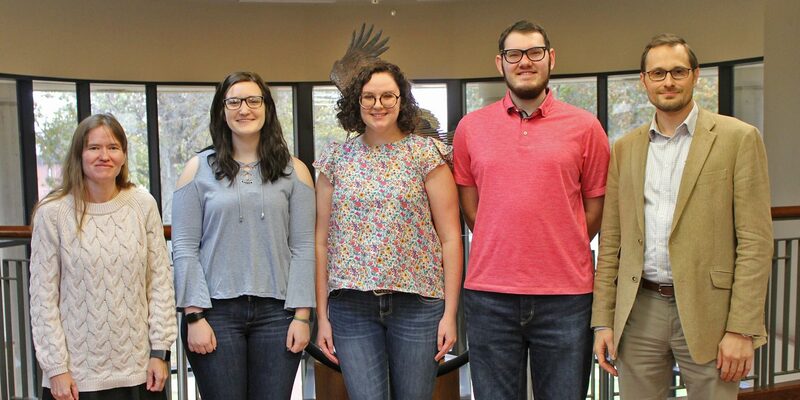 The students will participate in preparatory activities and study during the spring semester and will then accompany three faculty members to Titusville, Fla., in May. Once in Florida, they will spend one month conducting research projects in marine conservation and performing community service to improve environmental quality in their work area. Dr. Ann Paterson, Nell Mondy Chair of Natural Sciences and professor of biology at WBU, will accompany the students for their Florida research, as well as Dr. Christopher Polachic and Dr. Steve McMann of the Williams science faculty. The research is being done in conjunction with A Rocha, a Christian nature conservation organization. WBU received a $12,000 STEM grant from the Bosch Community Fund to launch the research project. The Bosch Company operates a plant in Walnut Ridge. Pictured above are (left to right) Dr. Ann Paterson, Kyrsten McLemore, Paige Johnson, Caleb Hickman and Dr. Christopher Polachic.